The city of Heliopolis was one of the major cities of ancient Egypt. The city appears in biblical Hebrew as On. Joseph’s wife was a daughter of a priest of On: “Pharaoh gave Joseph the name Zaphenath-paneah; and he gave him Asenath daughter of Potiphera, priest of On, as his wife” (Genesis 41:45). The city appears as Aven in the book of Ezekiel: “The young men of Aven and Pi-beseth shall fall by the sword, and those towns shall go into captivity” (Ezekiel 30:17 TNK). In ancient Egypt, On was the center of sun worship. The word “Heliopolis” means “the city of Helios” or “the city of the sun.” In the Hebrew text of Jeremiah the name of the city appears as “Beth Shemesh” or “the house of the sun.” In the magnificent temple found in the city, the sun was worshiped with an annual festival dedicated to the sun god Ra and also to the god Atum, the setting sun, or the sun of the Underworld. The city of Heliopolis was dedicated to the worship of the sun-go Ra. Heliopolis was known for its many obelisks. According to Egyptian records, two obelisks stood at the entrance of the temple, one on each side, similar to the two pillars, Jachin and Boaz, that stood at the entrance of Solomon’s temple (1 Kings 7:21). 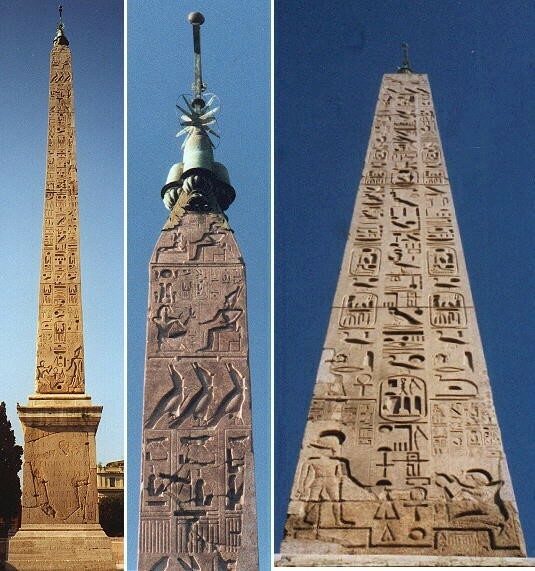 Among the many obelisks erected at Heliopolis were the ones by Seti I and Ramses II. The prophet Jeremiah speaks about the destruction of the obelisks at Heliopolis. He wrote: “He [Nebuchadnezzar] shall break the obelisks of Heliopolis, which is in the land of Egypt; and the temples of the gods of Egypt he shall burn with fire” (Jeremiah 43:13). Whether Nebuchadnezzar destroyed the obelisks of On (Heliopolis) is not known because nothing is mentioned in Babylonian records. However, ancient historians report that Cambyses conquered Egypt in 525 B.C. and at that time he burned the temple at On and also destroyed the obelisks that were found there. The obelisks of Heliopolis, like those of other Egyptian cities, found their way to new locations once the city diminished in importance, and their removal and re-erection makes for fascinating reading. Two obelisks of Heliopolis set up in 1468 B.C. by Thutmosis III, were brought to Alexandria by Caesar Augustus before the Christian era. Known as “Cleopatra’s Needles,” one found its way to London in 1878, where it was erected on an embankment along the Thames; the other went in 1879 to Central Park in New York City, where it stands today behind the Metropolitan Museum of Art. Another obelisk begun by Sethos I but finished by Ramses II, which originally graced the sun temple of Heliopolis, was removed by Caesar Augustus from Egypt in 10 B.C. and re~erected in the Circus Maximus at Rome. Today this colossal pillar, 32.77 meters in height and weighing an estimated 235 tons, stands in Rome’s Piazza del Popolo. On it is an inscription calling Sethos I “the one who fills Heliopolis with obelisks that their rays may illuminate the Temple of Re.” Three more Heliopolis obelisks erected by Ramses II were moved by the Caesars to Rome; one also to Florence. The ones in Rome are at the Piazza della Rotunda, the garden of the Villa Celimontana, and the Viale delle Terme di Diocleziano. The one in Florence is in the Boboli Gardens. One of two obelisks erected by Psammetichus II at Heliopolis now stands at Monte Citorio in Rome. Ramses II, also known as Ramses the Great, who probably was the pharaoh of the Exodus, was one of the greatest and one the most powerful pharaohs of Egypt. History celebrates Ramses as a great builder of cities, temples, and monuments. According to the biblical text, it was he who built the supply cities of Pithom and Rameses (Exodus 1:11). The many obelisks of Ramses II found in several cities of Europe show that Ramses is still remembered by the legacy he left behind. Jack R. Lundbom, Jeremiah 37-52, The Anchor Bible (New York: Doubleday, 2004), 150. This entry was posted in Archaeology, Egypt and tagged Archaeology, Egypt, Obelisks, Ramses II. Bookmark the permalink.